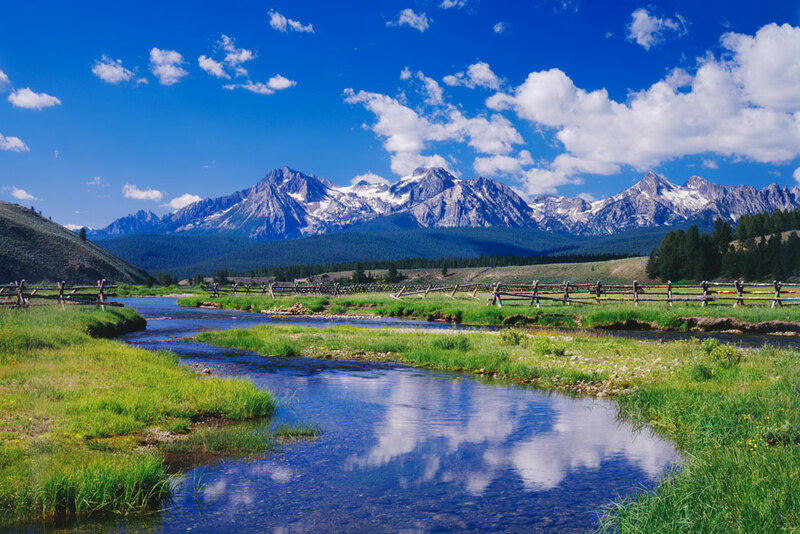 The Sawtooth Range is seen near the Sawtooth National Recreation Area located in Stanley, Idaho. This report provides a path forward for federal, state, and city governments to safeguard the ecological and economic health of the American West by protecting and restoring its waterways. In the 50 years since the act was passed, there has certainly been much to celebrate—almost 12,000 river miles now enjoy protection under the act. Landmark environmental laws, such as the Clean Water Act, have led to the cleanup of many damaged rivers—including the Cuyahoga River in Ohio, which repeatedly caught on fire, most infamously in 1969.6 And the nation has developed a collective awareness about the connection between natural, free-flowing rivers and quality of life. Today, a proposal such as the Bridge Canyon Dam would be considered dead on arrival. Development within rivers and flood plains impedes the environmental function of Western rivers, driving declines in species such as salmon, and creating increasingly evident vulnerabilities to drought across the West.10 Damage to rivers also results in economic costs that are often unaccounted for, such as catastrophic floods or dam breaches that put private property and infrastructure like drinking water, irrigation, and hydropower, at risk. Communities, businesses, and government agencies across the West have started taking steps to address these problems. However, many tools to protect or restore Western rivers are underutilized, and investments in restoration and management improvements to protect agriculture, ecosystems, and city water supplies are too rarely adopted. Protect what’s left of the large, natural rivers. Through the Wild and Scenic Rivers Act and other tools that protect both land and water, federal and state agencies should set an ambitious goal to guarantee permanent protection for half, or about 2,300 miles, of the remaining large, natural rivers in the West that run through unprotected lands. Conserve and restore headwaters. Policymakers should prioritize expanding watershed restoration efforts by federal land agencies; reforming mining laws to reclaim abandoned mines and reduce risks to rivers; and attracting investment from utilities and private firms to protect headwater resources through forest and river restoration. Rethink river infrastructure. When it comes to levees and dams, federal and state agencies must modernize necessary functions and restore natural processes where built infrastructure is no longer a net benefit. Collaborate to improve the health of entire watersheds. Invest in efficiency and conservation efforts to protect both rivers and the communities that depend on them. This includes working on demand for water with both landowners and cities and supporting private lands conservation efforts that improve river health. Taking these steps at the federal, state, and local levels will build on growing efforts to scale up conservation and restoration projects that are emerging across the West. By securing the natural heritage of its rivers, the West can ensure a better future for its people. 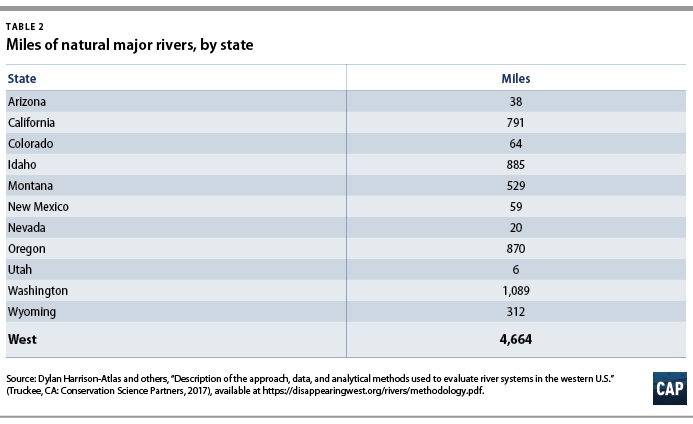 In February 2018, the Center for American Progress and Conservation Science Partners—a nonprofit scientific organization that specializes in cutting-edge data science and mapping—released the first comprehensive evaluation of the state of rivers in the West. The analysis considered a wide range of factors, including dams, diversions, and development on more than 280,000 miles of waterways—from tiny headwater streams to major rivers such as the Colorado and Columbia. 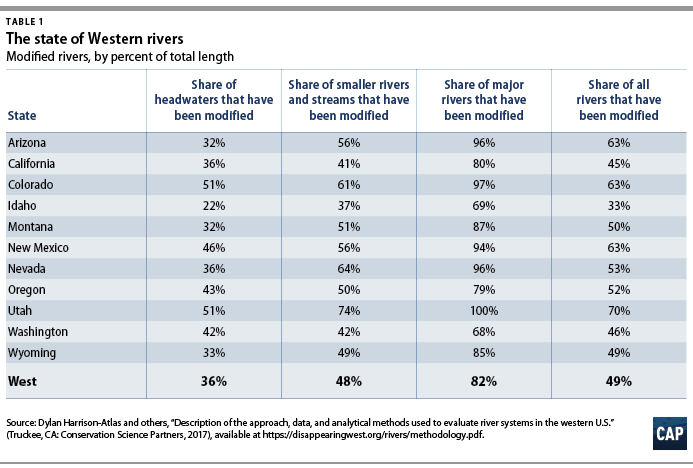 The results, some of which are laid out in Table 1, demonstrate the extent to which Western rivers have been altered—almost half, or 49 percent, of all river miles in the region are no longer natural—and form the basis for the recommendations in this report. For more information and the results of the Disappearing Rivers analysis, visit DisappearingWest.org/Rivers.html. But there is hope. CAP’s analysis found that where rivers in the West flow through protected lands—such as national parks, wildlife refuges, and wilderness areas—they are on average 50 percent more natural than the river miles that flow through unprotected areas. This shows that land conservation strategies can help maintain or improve the health of the few big, natural rivers that are left in the West. If policymakers can protect the rivers themselves—or the adjacent land through which they flow—they can dramatically improve the outlook and health of rivers. With 80 percent of major rivers already altered from their natural state, it is critically important to protect the limited number of major rivers that still maintain their natural characteristics. CAP recommends that policymakers conserve half, or about 2,300 miles, of the remaining large, natural rivers through land or rivers protections. There are a number of available state and federal policy tools to accomplish this. Land protection laws, such as the Wilderness Act of 1964 and the Antiquities Act of 1906, can protect the natural qualities of rivers on federal land by enacting stronger conservation guidelines for land managers. And the Wild and Scenic Rivers Act allows for federal protections tailored to the values of a specific river, including its natural qualities or the recreation value it provides. The federal government has several tools at its disposal to protect the last big, natural rivers. Congress should use its authority under the Wild and Scenic Rivers Act to review existing recommendations for Wild and Scenic River designations by federal land management agencies and direct an independent assessment of potential protections for the remaining natural stretches of major rivers identified in CAP’s analysis, including river miles flowing through both public and private lands. Working with local communities to identify opportunities, Congress and the Trump administration should use their authorities under the Wild and Scenic Rivers Act to protect the last wild, major rivers. They should place special emphasis on the recreation value or wild traits of large rivers outside existing protected areas, in order to conserve the economic and environmental contributions of these major waterways. Congress and the Trump administration should also use land protection authority, including the Wilderness Act or the Antiquities Act, to enhance protections for lands around key rivers on protected lands to secure their natural characteristics. States and communities can take their own steps to protect rivers for their natural characteristics. State policymakers should prioritize protections, such as state parks, new recreation areas, and conservation easements, around vulnerable wild rivers. In 1968, Congress passed the Wild and Scenic Rivers Act so that certain rivers “shall be preserved in free-flowing condition, and that they and their immediate environments shall be protected for the benefit and enjoyment of present and future generations.”13 Under the act, Congress has the flexibility to tailor protections for rivers as wild, scenic, or recreational, depending on the use and development of the river. Roads pose another significant challenge for river health. Throughout the West, road construction has historically depended on the installation of culverts, metal tubes that allow water passage under road crossings. But culverts interrupt the shape of natural river courses and restrict flow patterns, disrupting habitat for important fish species such as cutthroat trout. Protecting rivers and small streams near their source has a positive impact on every community that lives downstream, especially those who rely on rivers and streams for drinking water.25 Therefore, policies that target restoration and encourage smart investments in headwaters and small rivers can have an outsized impact on the health of Western watersheds. But agencies first need greater resources to make headway on watershed restoration. The following are several opportunities to make these investments. Congress should use smart policy to safeguard headwaters and direct funding toward restoration of rivers, streams, and the landscapes through which they flow. Federal mining policy is antiquated, with limited avenues to fund cleanup or restoration of abandoned mines. Congress should pass one of the proposed bills that implement a fee or royalty program to generate a fair return for the public from its mineral resources and direct these funds to treat mining sites that threaten the West’s rivers and streams. Congress should use the 2018 farm bill as an opportunity to increase funding for culvert removal and road renovations through the Forest Service’s Legacy Roads and Trails program. 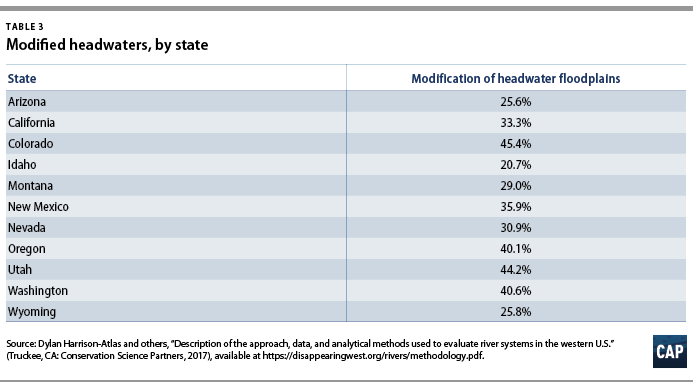 The connection between the health of headwaters and drinking water infrastructure downstream is increasingly clear. States and cities should work to secure the health of this natural infrastructure, drawing on the experiences of a growing number of forward-thinking communities. Western communities and decision-makers have been paying greater attention to forests and headwaters for the services they provide—notably as an important supply of clean drinking water. Approximately 180 million Americans across the nation get their drinking water from sources in national forests.34 This new focus has been paying dividends for downstream communities, and there is room to expand on this success. It is increasingly common for utilities to partner with the Forest Service and other landowners to fund forest restoration to protect water supplies.35 For example, after studies showed Santa Fe, New Mexico, could incur up to $280 million in damages to their reservoirs and outdoor recreation industry from a catastrophic wildfire, the local water district began investing roughly $250,000 annually in forest restoration projects to reduce fire risk.36 Several utilities along Colorado’s Front Range, including Denver Water, have partnered with the Forest Service to make similar investments against the risks that catastrophic fires pose to their reservoirs.37 In 2012, the citizens of Flagstaff, Arizona, voted to approve a $10 million city bond to finance forest restoration—including prescribed burning and carefully planned tree thinning—in the Coconino National Forest, which supplies 50 percent of the city’s drinking water. States have also moved to make it easier for cities to pursue similar programs. In 2016, the California Legislature passed AB 2480 to help utilities mitigate stressors to the state’s water supply after years of drought.38 The law recognizes the value of forests and watersheds to drinking water infrastructure, which enables utilities to use the same financing approaches used for built infrastructure to pay for watershed restoration. Conserving landscapes, such as wet meadows in the Sierra Nevada and Cascades mountain ranges, can support California’s water supply more cost-effectively than new construction, saving ratepayers money. These partnerships with utilities are important for the Forest Service, since they help amplify federal funding streams for restoration. As these partnerships have developed, the Forest Service has refocused on its original charter—to secure water supplies39—by incorporating the value of watersheds into its planning processes and creating data sets that guide investments in their restoration. One such program, called Forests to Faucets, connects land cover data with maps of drinking water withdrawals to measure the relative importance of different watersheds to the public. This helps partners, such as drinking water utilities, decide where restoration of forests or mountain meadows might be good investments to protect drinking water. The Forest Service has also undertaken restoration of degraded waterways through the Legacy Roads and Trails program. Thus far, the program has funded culvert removals that have reconnected more than 1,500 miles of streams in the past 10 years. But thousands of miles of river remain fragmented.40 Restoring more of these small streams, many of which are spawning locations for salmon, trout, and other important species, would have significant environmental and economic benefits. Whether a dam is necessary or can be removed, there are tested solutions that can dramatically improve the health of Western rivers. For large and important dams, structures that allow for fish passage, such as interconnected pools called fish ladders, which gradually swim over dams, have been used to help connect habitats on either side of dams. Releasing water from a dam to mimic historical river and flood patterns can improve flow and restore sediment movements downstream that are necessary to maintain fish habitat. These types of reforms cannot fully restore rivers, but they can reduce the effect of dams on flow and wildlife, as well as better balance competing needs. For dams that no longer serve their purpose, policymakers and dam owners should consider dam removal and explore creative funding mechanisms to reconnect rivers. As river infrastructure ages, federal agencies need to reconsider their role in the future of dams. The U.S. government should identify ways to encourage private investments to remove dams that have been identified as obsolete or dangerous. One option is through wetland mitigation requirements under Section 404 of the Clean Water Act.44 Run by the Army Corps of Engineers and the Environmental Protection Agency (EPA), mitigation banking is estimated to generate more than $2.9 billion in funding for restoration to compensate for development’s impacts on wetlands and streams.45 Restoration for streams and rivers alone is already estimated to generate $230 million to 442 million annually.46 Mitigation has occasionally been used as a funding source for dam removal, but rules should more clearly define it as an acceptable form of compensation for wetland impacts. Previous clarifications, including the 2008 mitigation banking rule that better defined restoration requirements, have led to large increases in private investment in restoration. States play an important role in the development of river infrastructure to protect rivers, ecosystems, and communities. States work with counties, communities, and FEMA to prepare for flood events. As these groups evaluate vulnerabilities and plan infrastructure, they should consult the growing evidence that healthy flood plains can protect property by absorbing floodwaters. They should also acknowledge environmental benefits—such as habitat for threatened species and recharge for groundwater—as additional values that flood plains provide. Land use policy should encourage communities to consider these multiple benefits when planning for development near rivers or prioritizing investments in potential flood-control infrastructure. Levees are embankments built to prevent the overflow of a river, and they now define the flood plains for many rivers. Some areas in the West, such as California’s Central Valley, boast complex levee systems that have significantly altered river ecosystems to protect farmland and communities from winter floods. Research has shown that with smart planning, these flood control structures can help restore river ecosystems that have been affected by development. One example is the Yolo Bypass, a system of levees and weirs that route floodwaters around the Sacramento metropolitan area. During winter storms and other flood events, the bypass can hold four times the amount of water as the main channel of the Sacramento River and protect the city from being inundated.57 During the rest of the year, the floor of the bypass is used for agriculture. Other states could adopt California’s approach by applying a multibenefit perspective in their flood protection plans.60 Policies that acknowledge the benefits of natural infrastructure as a flood control tool will help ensure that upgrades and management can be done in a way that capitalizes on the value of more natural flood plains. In many ways, there is no more complex management challenge than a river, which flows through myriad political boundaries and ecosystems; experiences demands from countless user groups; and faces existential threats from climate change and innumerable other human activities. There are two approaches to balancing Western communities’ water needs and the health of river systems: conservation of river flows, and restoration and protection of river channels and flood plains. Finding solutions that engage private actors and balance different interests across the watershed should be a priority for states and for federal agencies. The federal government should use its convening power and existing conservation programs to direct more resources to improving watershed health. The Watershed Protection and Flood Prevention Act created a National Resource Conservation Service (NRCS) program to provide technical and financial assistance for watershed restoration projects on private lands—such as irrigation upgrades in Oregon to conserve water—but funding is inconsistent. 62 Congress should guarantee funding in the 2018 farm bill for this program. The 2014 farm bill created new conservation approaches at the U.S. Department of Agriculture (USDA) that emphasize partnerships and common geographies, such as regions and watersheds, and innovative solutions to shared problems. The Regional Conservation Partnership Program (RCPP), an NRCS effort, could better encourage watershed-level programs by making it easier for downstream water users, such as utilities or companies, to work with landowners upstream.63 Support for innovative approaches through programs like the Conservation Innovation Grants, could be expanded to help more complex river conservation efforts such as water quality trading or water markets become established. Partnerships among agencies and states in the Colorado River basin to pursue the twin goals of protecting communities and the river provide a good example of the benefits of coordination at the watershed level across the West. Cross-agency working groups that include the USDA, the U.S. Department of the Interior, the EPA, the Army Corps of Engineers, and other relevant federal agencies would help ensure that agency actions are better directed at resolving the environmental, social, and economic challenges present in each watershed. Some watersheds, such as the Yakima River basin and the Colorado River basin, already have cross-agency working groups, which can provide a model for expanding coordination. State and city policy plays a key role in water use and should be adapted to give water users tools to invest in conservation. Adaptation to future water availability should be based on thoughtful planning rather than a reaction to crises. As the climate changes, states should use water plans to examine longer-term vulnerabilities and prepare cities and water districts to proactively invest in conservation activities that will protect the public from future droughts and build capacity to balance urban, agricultural, and environmental needs. Maintaining river flow, and protecting it during times of drought, is complex. Conservation measures are becoming more effective, but can and should be expanded, especially in areas where droughts are commonplace. Pilot programs focusing on basin-scale conservation have shown promise for organizing scarce water resources across both urban and agricultural landscapes. In 2014, the Bureau of Reclamation launched the System Conservation Pilot Program in the Colorado River basin to maintain sufficient water levels in Lake Powell and Lake Mead through voluntary conservation efforts. Since its inception, the program has saved more than 115,000 acre-feet70 of water that can be stored in the reservoirs.71 Because raising water levels in the two reservoirs create shared benefits—when levels drop below a certain elevation, water deliveries decline for everyone—the effort is viewed as a win-win for all. Landowners who volunteer to implement conservation practices are compensated, and their contributions are temporary, so there is no concern that their participation forfeits permanent water rights. While long-term declines in precipitation across the Colorado River basin remain concerning, the lessons from this program provide some insight into how communities can adapt to protect rivers and the people who depend on them. There is a growing list of success stories where policy can engage landowners and investors in successful river, channel, and flood plain restoration projects. The Sage Grouse Initiative, a landmark program within the NRCS to help protect and restore habitat for the greater sage-grouse, has focused much of its efforts on protecting and restoring rivers on ranches across the sagebrush expanses of the intermountain West. These riverine habitats are key to survival for the sage-grouse and 350 other species but are also critically important for ranchers who need good water supplies for their livestock. In the upper reaches of the Colorado River basin, ranchers have partnered with the NRCS and nongovernmental organizations (NGOs) such as American Rivers and Trout Unlimited to restore river function by building riffles and other in-channel barriers that slowed flow and added oxygen to the river.72 The improved habitat spurred trout recovery, and the slower flows raised the water table, which benefited ranchers along 10 miles of the Colorado River. Both the Sage Grouse Initiative generally and the Colorado River restoration project specifically are due, in part, to the RCPP. The RCPP targets specific ecosystems and watersheds, funding landowners who develop projects in partnership with NGOs, businesses, and government agencies. This regional focus is promising but can be better leveraged to encourage conservation when the direct benefits to a property owner are lower or less obvious. With half of its river miles damaged by development, the West is at a crossroads. Policymakers can maintain the status quo and continue to lose the function of rivers, or they can tap into new ways of thinking to restore and protect rivers as the foundation of Western communities. Only by charting a new path can policymakers secure a more stable and prosperous future for the region. But these new policies will require investments in the United States’ public lands; smart restoration of rivers and the infrastructure that shapes them; additional protections for natural rivers; and a commitment to working with landowners and cities to pursue shared goals that improve water security and the health of river systems. In the 50 years since Congress passed the Wild and Scenic Rivers Act, policymakers have made great progress in restoring the nation’s rivers. But the threats facing western rivers are different today than they were when the law was first passed. Hopefully, future generations will look back at how the nation responded to this new time of crisis for rivers and remember that society again took a forward-looking stance to benefit the health of communities, the survival of ecosystems, and the future of the West. The author would like to thank Mary Ellen Kustin, Kate Kelly, Matt Lee-Ashley, Emily Haynes, and Nicole Gentile for their assistance in the preparation of this report.